Oh how I love St. Patrick’s Day, because it’s an excuse to drink beer and eat well! It could be my Scotch-Irish roots that have always had me enjoy this holiday. 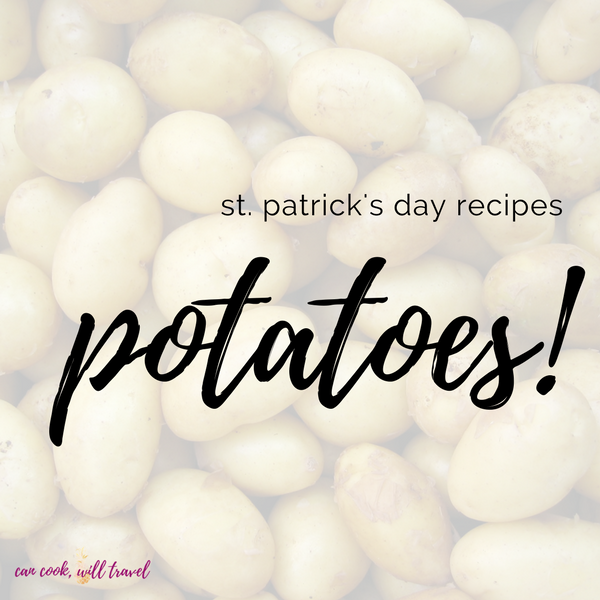 It’s probably also the fun memories I’ve made over the years that prompted me to create this ultimate St. Patrick’s Day recipes list. As a kid, my mom was big on celebrating the holiday. Each year she’d have corned beef and cabbage ready for dinner, and it is probably what made me love vinegar so much. We’d have traditional potatoes, carrots, and cabbage with our corned beef, which I’m promptly douse in vinegar. Oh yum! Then there was that St. Patty’s Day in college when I was finally 21. My friend and I drove around singing Irish pub songs at the top of our lungs, and started day drinking. That was also the day I had a yard of green beer for the first time. In addition, I had my first Irish car bomb to impress a guy at a bar. 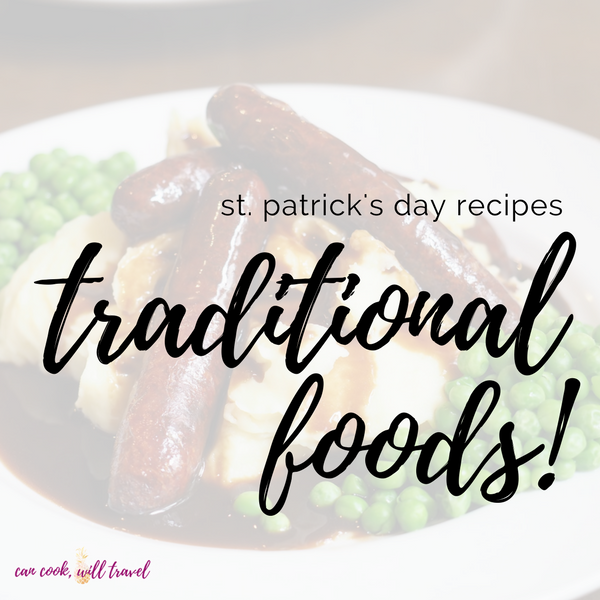 Some of my personal favorites include Irish nachos, colcannon, corned beef and cabbage, bangers and mash, Irish stew, and pretty much any recipe that gives me an excuse to put beer or alcohol in my food. 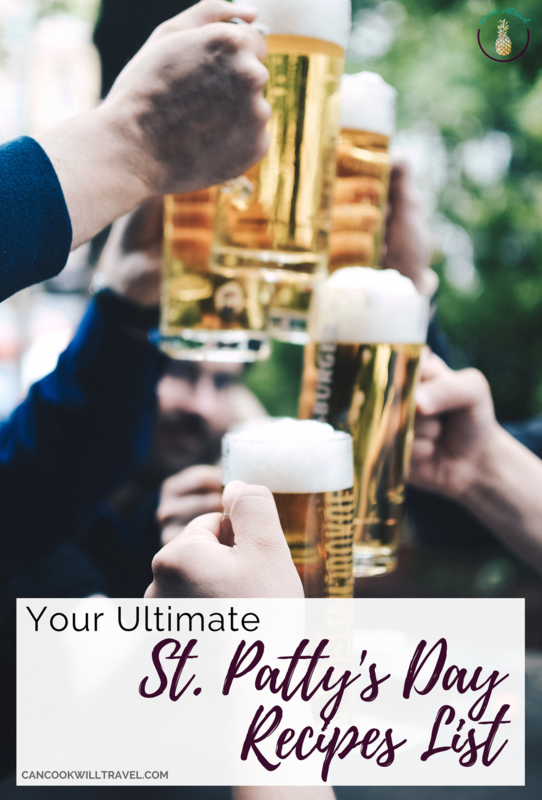 Now this ultimate St. Patrick’s Day recipes compilation is pretty large, so here’s how I’ve broken it down for your convenience. You’ll find the following categories that you can click on to go straight to that section. Also I’ve tried my best to note which recipes are gluten free (GF) and dairy free (DF) for you too. Cabbage: Those dishes that have cabbage in them. Potatoes: You guessed it…the recipes with potatoes as the star! Beer: Any recipe that features beer to jazz up a dish. 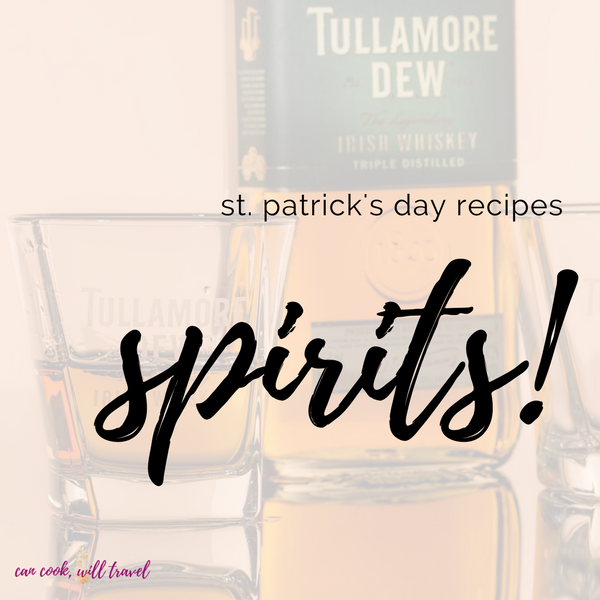 Spirits: Whether it’s Irish whiskey, Baileys or more, you’ll find quite the yummy roundup here. Traditional Fare: Anything that is a traditional dish you might find in a pub or an Irish family’s table. Sweets: These are pretty much all desserts that don’t include alcohol in case you’re cooking for kids or don’t drink. Balsamic Honey Roasted Cabbage Steaks – GF & DF – I love this healthy side that is a perfect excuse to roast cabbage and douse it in vinegar! Roasted Cabbage – GF & DF – Steam wedges of cabbage in foil packets in the oven with lemon, Worcestershire sauce, lemon, and olive oil for a stellar side! Oh and did I mention there’s bacon involved, so that should pretty much seal the deal! 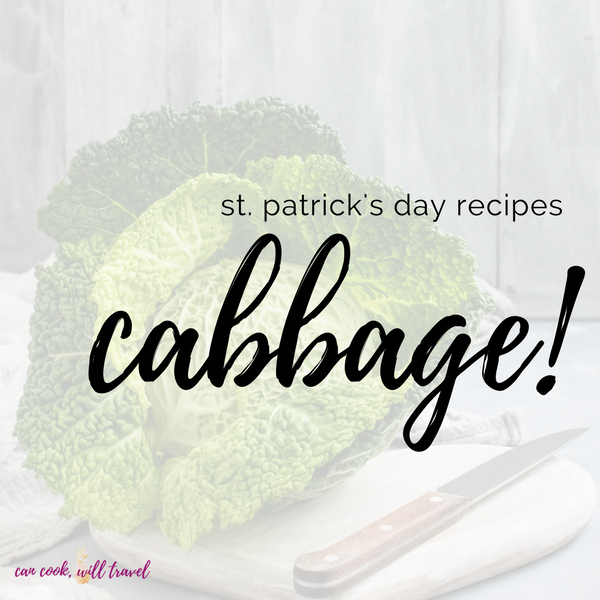 Crock Pot Corned Beef & Cabbage – If I think of one meal on St. Patty’s Day, then this is it. I grew up eating this meal every year and I still love doing so. In fact, it’s a great reason for me to enjoy vinegar, which I LOVE! Stuffed Cabbage Casserole – GF – Oh how I love this recipe, because it’s got so many comfort food qualities going on. It’s a one pot dish that’s packed with beef, rice, tomatoes, cabbage, and then add some spice and cheese to it for a your family’s new favorite recipe! Corned Beef & Cabbage Egg Rolls – These egg rolls are served with an avocado lime dressing, and I’m loving this recipe! Not only do they look festive with the dressing, but they have corned beef and cabbage, which I love! Irish Nachos – GF – When I first made this recipe a few years ago, I made it twice in one week. I was not perfecting the recipe, because it was already perfect. With sliced potatoes as a base and topped with cheese, bacon, green onions, salsa and sour cream, it’s pretty much a perfect appetizer! Irish Colcannon – GF – This colcannon is basically mashed red potatoes that you toss with cooked kale and cheese. So yeah this is pretty much what I hope and pray heaven serves on the regular. Irish Potato Bites – GF – I’m such a sucker for potatoes, and these are adorable! Boil red potatoes and then scoop out the center and you’ll end up filling them with potato, corned beef, and cheddar cheese. Yep, I’m sold! Gluten Free Boxty AKA Irish Potato Pancakes – GF – All I needed to read was “potato”, and I’m in. This is a perfect use of leftover mashed potatoes to add cream or yogurt to plus lots of spice and herbs and cheese of course! Honey Beer Bread – I’m pretty convinced that the only way homemade bread gets any better is if it has honey and beer in it. And the best part is that it’s quick to make and you don’t have to let the bread rise…thanks, beer! Beef & Guinness Stew – DF – This recipe was one I made way back in year 1 of my blog to celebrate St. Patty’s Day. So it’s totally appropriate that it makes this ultimate St. Patrick’s Day recipes list, because it’s booze-filled and seriously delicious! Drunken Pork Chops – DF – Start cooking pork chops and then finish them off in a beer sauce to make them juicy and flavorful. 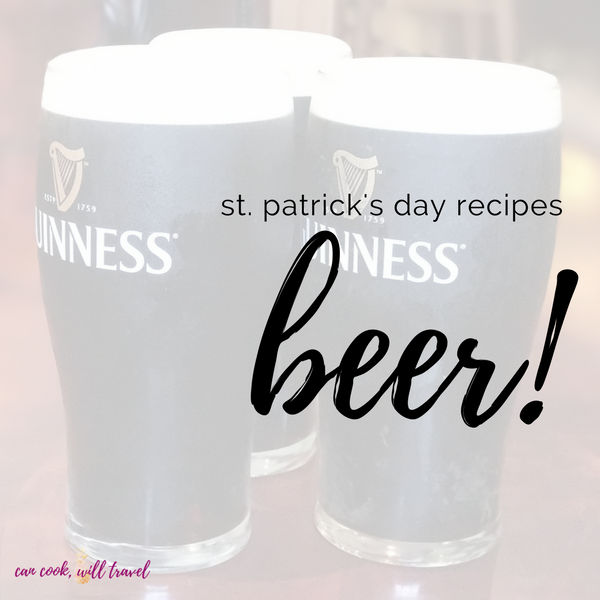 I’m pretty sure the Irish would approve of this recipe! Beer Cheese Dip – Save this recipe as the temperatures warm up, because this cold dip is fabulous! With cream cheese, beer, ranch flavors, cheese and beer, there really is SO much to love about this recipe! Pretzels with Sriracha Beer Cheese Sauce – When you’re feeling like you want to channel Martha a bit, whip up this recipe. It’s a bit of work but totally worth it, which I know because my dad has asked me to make it again several times. Blue Moon Cupcakes – If you love a Blue Moon beer with an orange slice, then you’ll need these cupcakes in your life. The beer and orange makes the cupcakes light, fluffy and flavorful, and a little orange to the cream cheese frosting is kinda perfection. Seriously this one is so good! Ale & Cheddar Soup – If you love beer cheese soup, then stop right now and click the link to make this one ASAP. I love the richness from the cheese and bacon plus the beer makes it rich and complex. Oh yes this one is a winner! Beef & Guinness Pot Pies – Oh how I love a yummy pot pie, and this one seems like my Beef & Guinness Stew (above) topped with puff pastry. Ooh doesn’t that sound amazing?! Irish Stew with Celtic Trinity Knots – Guinness is the fun addition to this veggie & barley filled stew. Then factor in the bread knots with Parmesan cheese and dinner is crazy good! Irish Whiskey Coffee Brownies – If you enjoy coffee, whiskey, and chocolate, then here you go and you’re welcome! Oh wow does the coffee and whiskey flavor this chocolate cake beautifully. And the coffee and whiskey make another appearance in the glaze, which is a very good thing! Boozy Chocolate Stout Cake – A chocolate cake with Guinness with a whiskey glaze, because how much more Irish do you get?! Mini Baileys Chocolate Cheesecakes – Who doesn’t love Baileys Irish cream, because I kinda question their judgment?! With Irish cream in the filling and topping, my mouth is already watering! Irish Car Bomb Bundt Cake – We’ve got another chocolate stout cake here, but this one is layered with an Irish Whiskey chocolate ganache followed by a Baileys glaze. So where to I sign up for someone to bake this for me?! Irish Whiskey Truffles – GF – These truffles look super easy to make and a crazy rich treat! Baileys Irish Cream Cheesecake – This dessert looks beautiful and rich with Irish cream in the cheesecake layer and a chocolate ganache over the top. Oh hell yes to this one! St. Patrick’s Day Mint Chocolate Cake – If you want a cake the is stunning and created to impress, then this is the one! A pretty marbling cake with lots of shaved chocolate on top, because it’s the right thing to do. Irish Jello Shots – Sure at this link you’ll find a kid friendly version, but I have no kids so this goes in this section. Because jello shots make the day a little more fun (and festive in this case)! Irish Soda Bread – DF – I’m pretty proud of this dairy free version of Irish soda bread, turned out beautifully. Raisins are optional, but you’ll find this bread to be the perfect side for the holiday! Guinness Shepherds Pie – Homemade mashed potatoes top a shepherd’s pie that looks like it’s PACKED with flavor, so I’m thinking I’d order this dish in a heartbeat! Beef & Guinness Stew – DF – This recipe was one I made way back in year 1 of my blog to celebrate St. Patty’s Day. 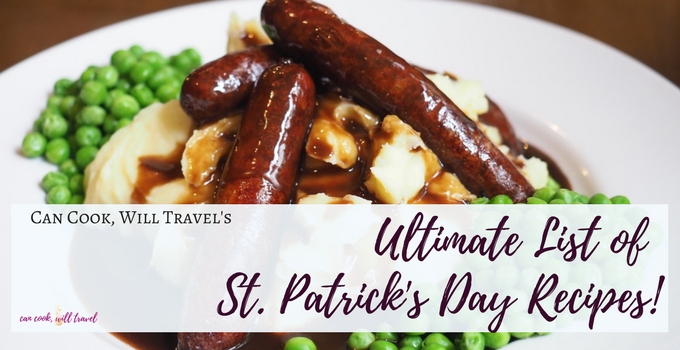 So it’s totally appropriate that it makes this ultimate St. Patrick’s Day recipes list, because booze and comfort food sum up this dish! 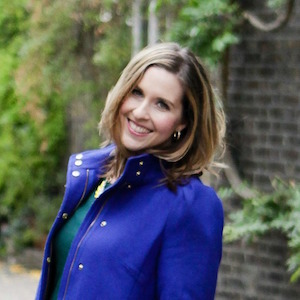 Dublin Coddle – DF – I don’t think I’d ever heard of a coddle, but I do like a cuddle! Actually a coddle has potatoes, sausage and a bacon stew that bakes away and sounds like it’s right up there with a cuddle too! Classic Reuben Dip – Everything you love about a reuben combined into a dip, because dips are the best! Corned Beef Hash – GF – I’m a huge fan of hash (check this one out here), and I can’t think of a better way to use corned beef leftovers! Bangers & Mash – I’m pretty sure that making my version of this will happen ASAP, but in the meantime enjoy this yummy one! Brownie Mint Trifle – If you can only make box mixes and don’t like getting very involved with baking, then THIS is the recipe for you! Literally it looks like a cinch! Green Velvet St. Patrick’s Day Cupcakes – Your standard red velvet cupcake made green is an adorable way to celebrate this holiday. 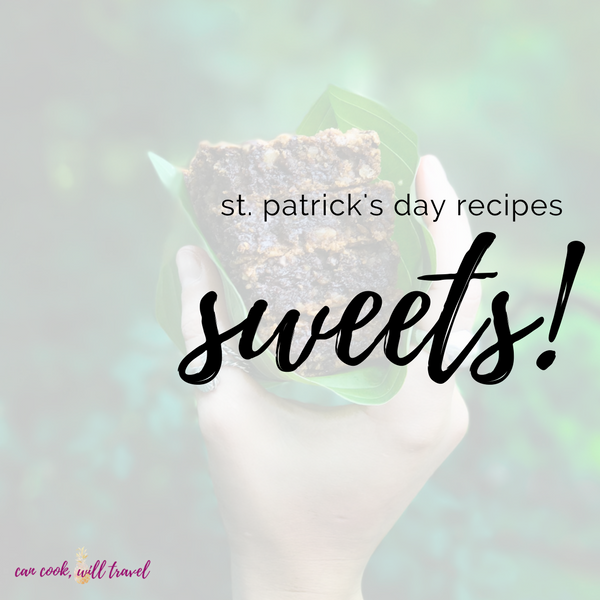 St. Patrick’s Day Mint Brownies – Jazz up box brownies and can frosting with mint Oreos for a festive sweet treat! Leprechaun Crunch Snack Mix – This sweet and salty snack has popcorn, pretzels, green candies and marshmallows for a fun treat. Yum! St. Patty’s Day Dipped Strawberries – If strawberries are your jam (see what I did there?! ), then make these! They are so cute and totally scream St. Patty’s Day! Mint Oreo Truffles – I love a good truffle, and they’re so easy to make! So make these fun green and white desserts for a chocolate treat! St. Patty’s Day Floats – Who doesn’t love an ice cream float?! These green beauties have 2 ingredients and sound so refreshing and delicious! Leprechaun Hat S’mores – These treats are for the baker who loves to be crafty and play, so whip these cuties up if that sounds like you! Now that’s an ultimate list, don’t you think?! What’s your favorite St. Patrick’s Day food – and yes, beer is a totally appropriate answer! For me, it’s probably corned beef & cabbage or some bangers and mash, because yum! Stay inspired & cheers to a delicious St. Patrick’s Day!